Well, just like that, another month is over. And what a month it was — we got the new Samsung Galaxies, we got the new Sony flagships, and tons of more cool stuff from MWC. Yeah, it was fun. But that doesn't mean that app developers collectively paused and didn't upload anything to the app stores. On the contrary — we've got a bucketfull of new software from both the App Store and Play Store. Don't worry, we went and sifted through as much as we can and picked out some cool apps for you. So, what do we have? 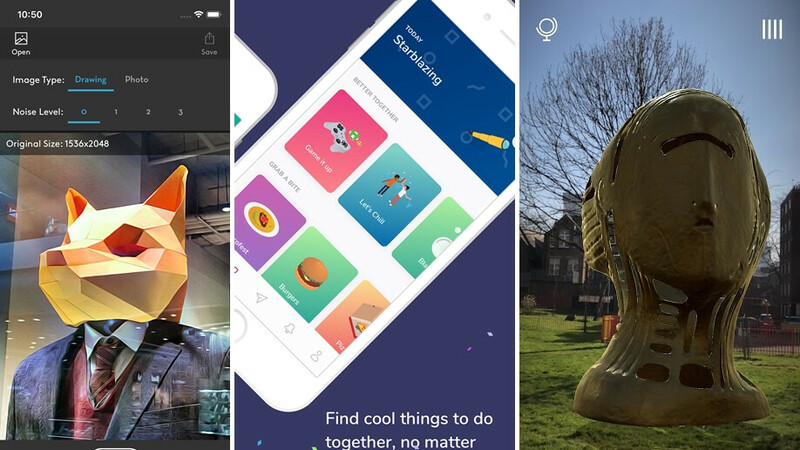 Microsoft's new photo transferring app looks really cool and makes it super-easy to get photos from your phone to your PC, then we have some fun voice-tuners to channel your inner Batman, a nice activity tracker or two, and some more AR apps. Let's dive right in! Coming from the Microsoft Garage project, this app's only goal is to make photo transfers from your phone to your PC fast and easy. You just scan a QR code that appears on your computer's screen, choose which photos to beam, and off they go via your Wi-Fi network. Want to teach your kids proper work ethic and money management? Starting with chores and earned allowance is a great idea and this app is designed to help you with that. The chores are set from the parent side of the app. Once reported as completed by the kid, the parent needs to send a final approval before a pre-set amount of money is transferred into the child's account. No actual cash is changing hands here. The child can choose to spend the money they have saved up by instantly shopping digitally from within the app — stores like Amazon or Applebee's are accessible. The oldest party game in the books — Charades — is back with a vengeance in the 21st century... with Emoji! Yeah, you need two devices for this one — one player holds a phone and tries to translate words or phrases into emoji. The rest of the participants view the emoji on a secondary screen and try to guess what the words are. Social marketing is a tough gig. Some might say “Hey, you just spam photos and polls every day”, but whoever has tried to work in the field knows that it's very easy to run out of ideas! It's a good idea to pre-plan a week or two in advance and know exactly what you are posting. If you need some ideas on how to fill up your schedule, Social Spinner can help — it randomizes content types and helps you compose random, non-repetitive posts. Sip will gather all the top stories and tech profile pieces for the day and feed them to you in a short format, once daily. That way, you can keep up with the current trends without getting too distracted from work... or can you? A chat app that revolves around organizing outings with your social group. Where should you go? What should you do? The user interface makes it super-easy to come up with and discuss the ideas. It will also recommend activities, once it has learned from you. We are all used to cropping and down-sizing our photos. But there are these very rare occasions when we wish a picture on our phone was actually bigger. This app will increase the resolution of your chosen picture up to two times by using an advanced algorithm that tries to place new pixels where they should be. As per the developer, it's best used for drawings or photo edits, meaning it will probably not yield the most natural result if you try to stretch a real-life photo. This app allows you to record a voice clip and then apply auto-tune, distortion, and crazy amounts of reverb to it. You can use it either to fix up your atrocious singing and fool everybody on social media that you have the X Factor, or you can just play around with the many filters and create funny voice messages for your friends. Podcasts are awesome, Apple's Podcast app... eh, not super-loved. Many 3rd party podcast apps that try to overshadow it exist out there. And a lot of them throw a barrel of features your way, hoping you will stick around instead of flee in panic. 'sodes reels it back a bit... It's simple, easy to understand, and doesn't bog you down with download queues, lists and whatnot. You tap your podcast, you listen to it — that's it. Big buttons, different themes, and keeping the phone unlocked are the only special featrues you will find here — and they count. Are you into ambient sound apps to help you concentrate, work, sleep, or meditate? Well, how about sounds that have been recorded in the 1960s and 70s? Well, that's what this app has. Translating old recordings from vinyl to digital, it rocks 22 tracks, each running for about 30 minutes. No loops or generated noise — real recordings of real nature. And one for the iOS musicians — Shire Whistle is a sampler that does pretty much what it says. It helps you compose the tune that will keep the spirits up while you are looking for the One True Ring. Textto is an app, which allows you to sync all your texts with your PC so you can keep your work and communication in one place, no unnecesarry distractions. This app lets you share your location in real time so your close ones can have a peace of mind when you are out on a long trip. Custom features like automated alerts when you've stopped moving and a low-power mode that reduces the location update frequency make it a nice alternative to Google Maps' integrated location sharing feature. BBC's new app uses Google's ARCore to put ancient artifacts in your viewfinder, let you inspect them up close, and learn about their history. It's just plain cool. Are you jealous of the Samsung Galaxy S9's Edge Panels? Well, no more — this app gives you the very same feature on any Android phone. Well, there's no way to add a physical curve to the screen where there isn't one, but hey — we'll take it! A social media for hikers and adventurers, letting you share photos and location tags of all the places you've been at. Then, brag to friends and your fellow hikers that use the app. This app lets you make cinemagraphs out of still photos that are already in your library. The way it goes about this is by giving you a wide selection of animated overlays, which you can apply to your photos. So, you can add moving dust, rain, smoke, or anything else to your still images. An RSS reader that lifts a bunch of useful features from Kindle to make your reading much more pleasurable, whether you are out in a bright day or snuggled under the blankets at night. This is a journaling app, which allows you to separate your entries in different stories. You can use it as an effective mood tracker, a diary, and a journal for different projects you might be working on... all at once. PIN protection adds an extra layer of security, in case privacy is a concern. Having trouble implementing good habits in your routine and eliminating bad ones? Find habit apps boring? Life's Game creates a virtual avatar of you. It's like an RPG game — when you accomplish tasks and chores, you get experience, while when you indulge in bad habits, your avatar suffers. Maybe that could help? A wallpaper app with a twist — Mapapers will make a minimalistic wallpaper out of a map. Just choose your location and your desired mix of colors and enjoy that slightly-familiar blotch of ink you get back!